I don't think a list of favourite gardening books can possibly miss out Colour by Design. This book is amazing, if slightly daunting, for a gardener of random design habits. 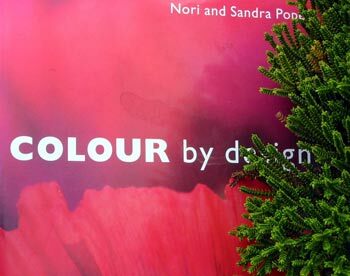 Nori and Sandra Pope, photographs by Clive Nichols. The colour concepts (and the photography) in this book will leave any reader spellbound, and possibly a little downhearted - wouldn't these beautifully colour-structured borders would be difficult to emulate? But I guess that's not the point. This is a book I return to from time to time, particularly if I'm trying to plan sensibly. Perversely I will never follow its advice. I never feel quite artistic enough. The authors have even visited New Zealand and given some lectures here (I didn't go).